Dr. Ramin Behmand has patients from all over California, the United States, and the world. We are happy to help each of these patients find their way to our office utilizing the most efficient and simple methods possible. Please continue reading to find local airports, transit recommendations, and accommodations conveniently located near our office. We are conveniently located 37 miles from San Francisco International Airport and 26 miles from Oakland International Airport. Car rentals are available at both of these airports; however, public transportation is easily accessible and widely used throughout the Bay Area. Both airports are located close enough to our office to allow you to make it to Walnut Creek in approximately 30-60 minutes. For patients interested in arriving a few days early for the surgery, we encourage you to take advantage of the wonderful activities the Bay Area has to offer. Our office staff is happy to recommend local restaurants, site-seeing opportunities, and other fun activities in San Francisco and the surrounding cities. Our patients can travel throughout most of the Bay Area using the affordable and convenient BART system. Patients traveling from San Francisco International Airport or other cities in the Bay Area should exit at the Walnut Creek station, where they may easily find a taxi in the awaiting taxi line. 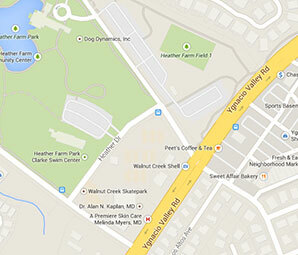 Our office is located less than 2 miles from the Walnut Creek BART station. If you have any questions or need additional guidance on local transportation, accommodations, and/or activities, please contact our office today. Our staff is happy to help make this trip as easy and enjoyable as possible.